It’s not uncommon for the films that turn out to be the best of any given year to have been released at the beginning of that year. Think of Lust, Caution, No Country for Old Men, The Diving Bell and the Butterfly, Juno and There Will be Blood – all released before the end of February last year and each a contender for best film of 2008. That confluence of quality is explainable largely by the early new year being the awards season – Golden Globes, BAFTAs, Oscars, etc – so it’s no coincidence that all of the above films were in the running at last March’s Academy Awards. Word of mouth has it Danny Boyle’s new film, Slumdog Millionaire, will be in the running at this year’s Academy Awards. It won the coveted audience award at the Toronto Film Festival in September and closed the London Film Festival in November with a standing ovation. Even if it fails to pick up an Oscar in March, it’s a sure bet that, come the end of 2009, it’ll be on many a film of the year list. In fact, reviews published in January are likely to bear that pre-emptive – though in no way premature – slogan. Shot on the streets of Mumbai by Boyle and a small British crew (including the director’s supremely talented regular cinematographer Anthony Dod Mantle) working in conjunction with a larger local team, Slumdog Millionaire is a tough and tender, hilarious and heartbreaking, realistic and fairytale-like adventure that mix-matches Bollywood melodrama (and musical), Dickensian street urchin yarn, gangster movie and love story. Lucid, coherent and dynamic, it’s as good as anything Boyle’s made yet, and quite possibly his best film to date, which is saying something given the Mancunian’s credits include Trainspotting, 28 Days Later, Millions and Sunshine. As impressive as the film and its reception has been, however, like its protagonist – a kid from the slums who finds himself one question away from winning the jackpot on the Indian version of Who Wants to be a Millionaire? – the making of Slumdog Millionaire is the story of an underdog. It certainly does. Watching the film produces the same kind of rush you get from the backpack-clad exploration of a foreign city and its alien culture, and Slumdog Millionaire is a genuinely optimistic crowd-pleaser. And for our troubled times this is no bad thing. The year in cinema starts here. 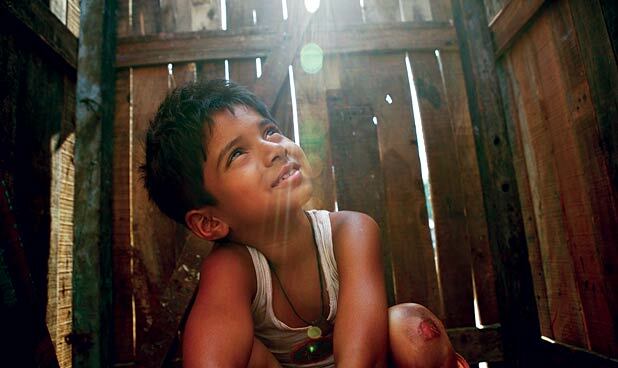 Slumdog Millionaire is on general release from Fri 9 Jan.